Have you ever seen finger limes? I found these cute little things at the Powerhouse Markets. They are grown near Brisbane. I have never seen them before and just had to try them. I actually forgot about them, so they are not as green as they were when I bought them, but they still tasted great. 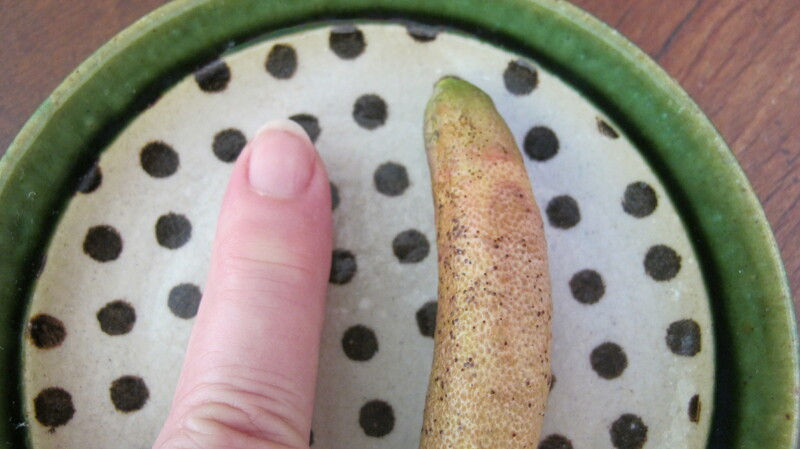 They are called finger limes because they are about the size of a finger – mine anyway. When you cut them and squeeze them, little delicious, lime flavoured balls come out. 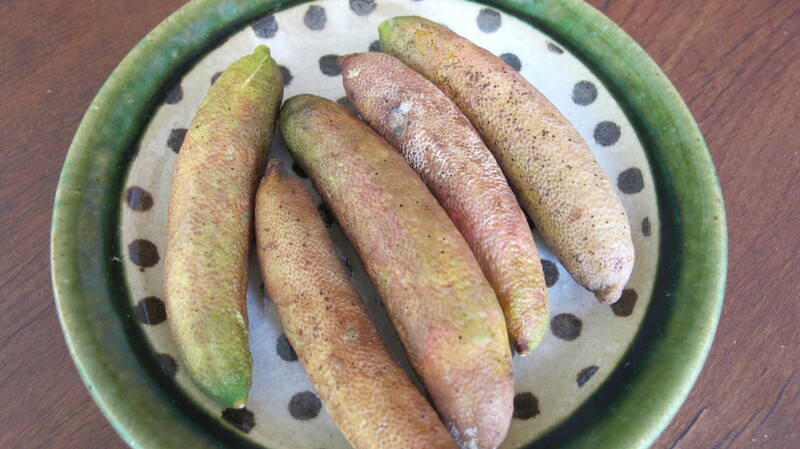 When you put them in your mouth they sort of pop with fresh lime flavour. They are great in salads. I know, I tried them. Keep an eye out for them. Does anyone know where they come from? Wow Deb. Never heard of these little beauties: I wont be able to try them until I get to Australia! 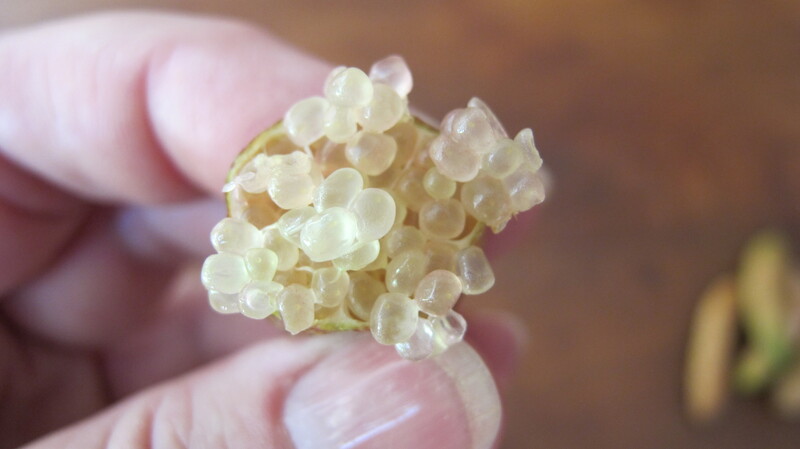 I sell desert limes from Australiss and they are very nice with ice cream. So weird. 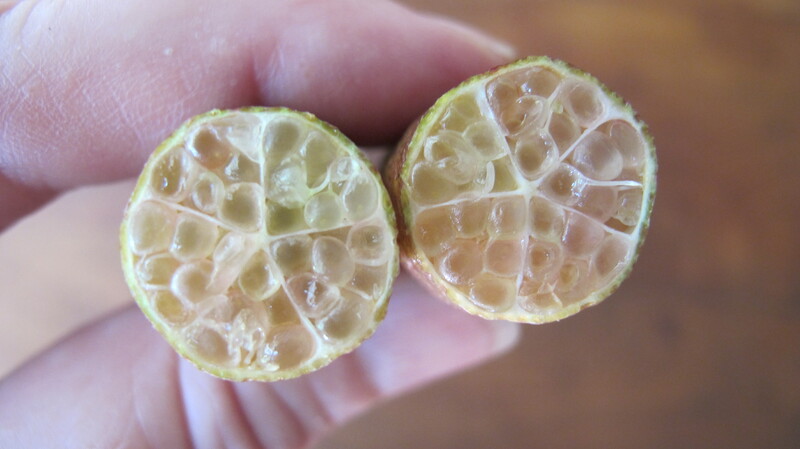 The inside looks a bit like the seeds of pomegranate…only pale yellow. How curious. Ugly little suckers aren’t they? I’ve only seen them when visiting my mother-in-law up on the Sunshine Coast. The person selling them at a market in Buderim said they are a subtropical Queensland native. They are a real burst of flavour. Enjoy them for us! Is that the finger lime or my finger? Yes for me too! I only discovered these little fellas last weekend at the farmers markets. They are funny little things aren’t they. I love the way the little bubbles of flavour burst in your mouth. I’m fairly certain finger limes grow as far south as Northern New South Wales. I love them when I can get them. They’re great for a little burst of lime in all sorts of things savoury and sweet, I imagine a few little lime ‘bombs’ would be nice in icing for a citrus cake. I’m not sure, but I think they might be native to Australia. Oh, and Joanna, we Aussies also have a sausage tree! … come to think of it we have a bottle tree too, good place Aus, eh? The grafted ones grow fine south of perth and even Melbourne. The seedlings are useless in Perth though i have some nearly 1.5 years old that aren’t even 2 inches – must need the subtropical minimums- northern nsw must be the limit like you say. I think you could be right. You should look for them – so delicious. I have been told that they are Australian natives. I had them served as a lime ‘caviar’ on top of some oysters and a few other times in a similar way with seafood. I love that burst of citrus…yum! What a great idea! They would be excellent on oysters. It is unbelievable how much I learn stuff from your blog Debra. never saw or heard of this lime, must taste incredibly tasty!!! Fingerlimes are native to the rainforests of northern NSW and South-East Qld, and in recent years have been grown commercially. See Wild Fingerlimes web site for more info!! Thanks for that, I will check it out. They are delicious little things.